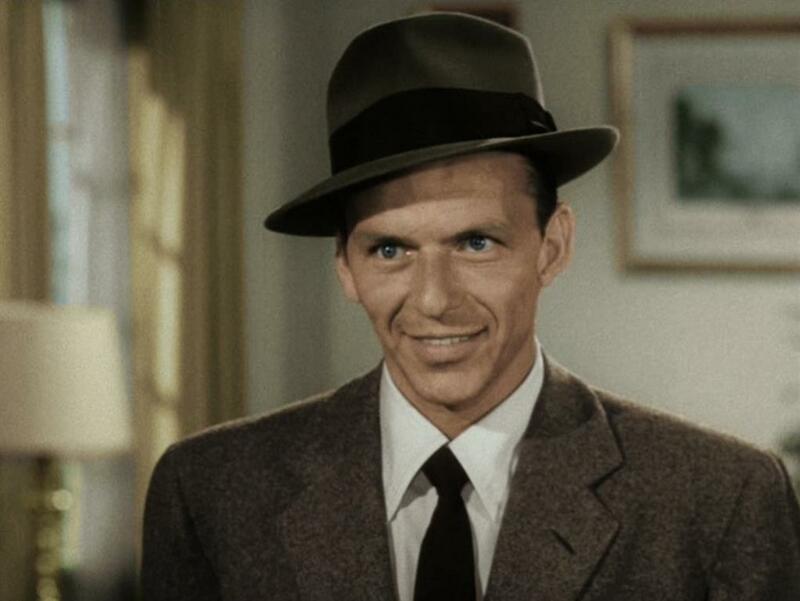 Coming off his Oscar-winning performance in 1953’s “From Here to Eternity”, Frank Sinatra plays the sinister, hired-assassin who is gunning for the President! 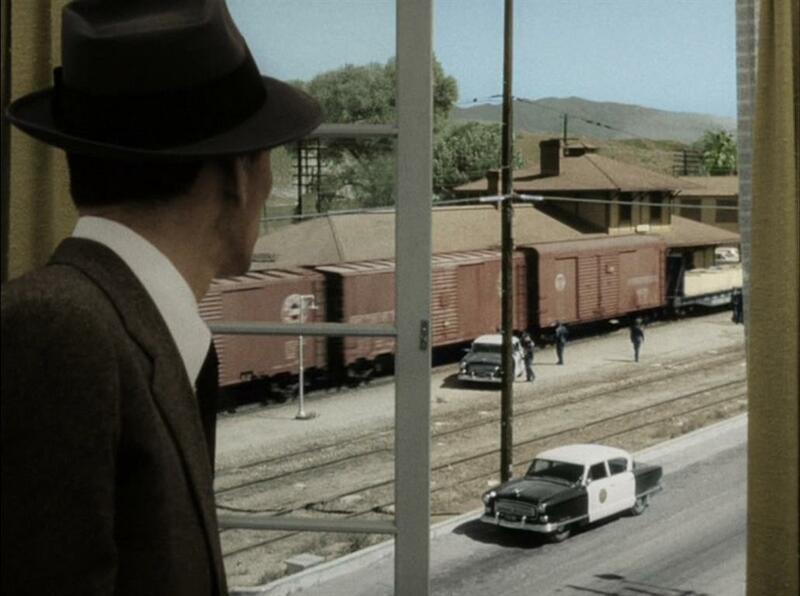 With his henchmen in tow, Frank descends on the sleepy little town of Suddenly, California. 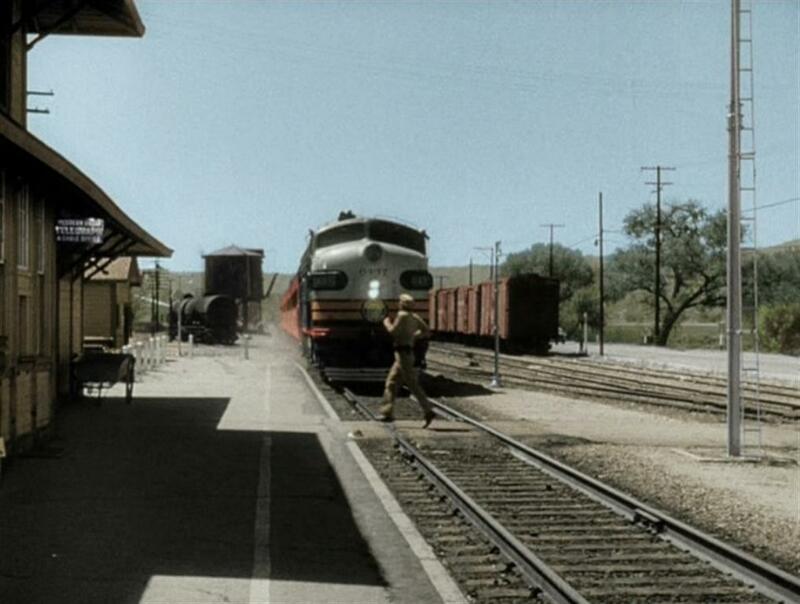 In the colorized version of this public domain movie, much of the early action centers around the two-story, Saugus, CA Southern Pacific depot. 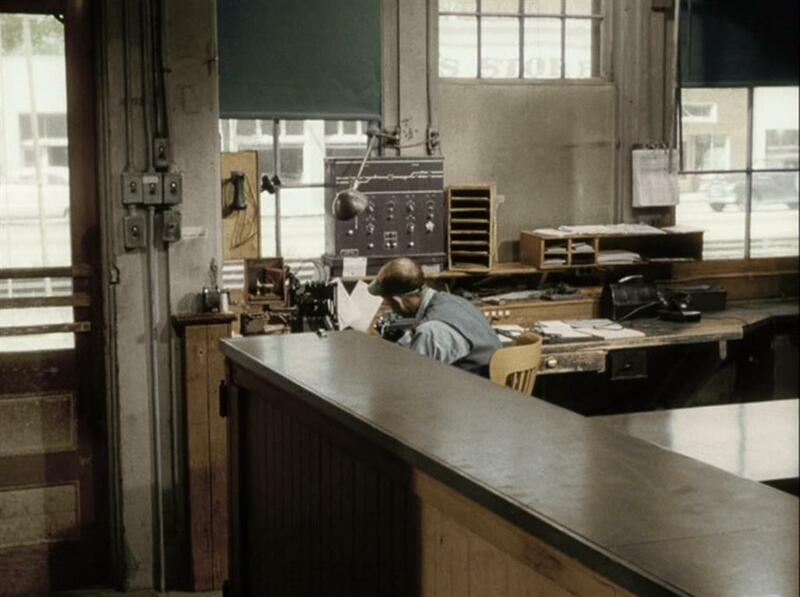 The movie takes us inside the station as well, getting a good look at the stationmaster’s tools: telegraph, trusty Remington typewriter, station order block signal levers, etc. 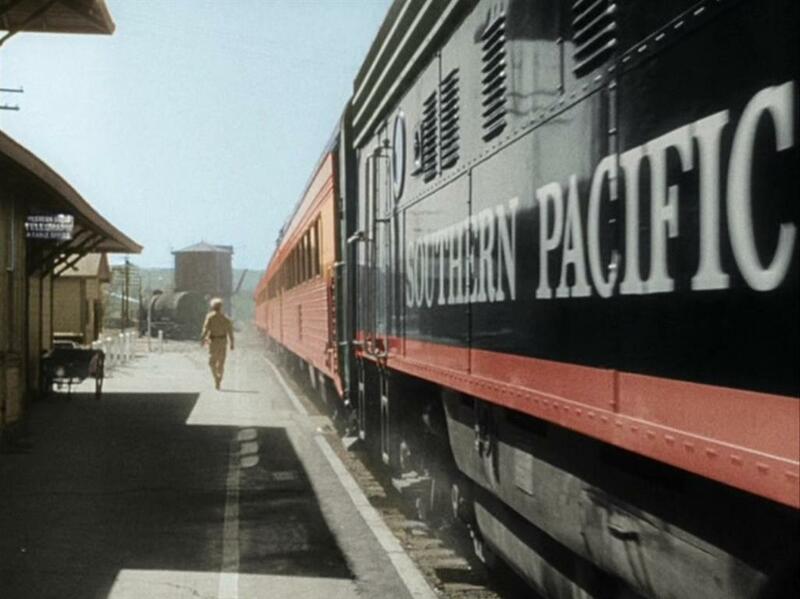 SP conductor waves from a bay window caboose bringing up the rear of a freight as the stationmaster’s helper wheels some l.c.l. freight along the platform. 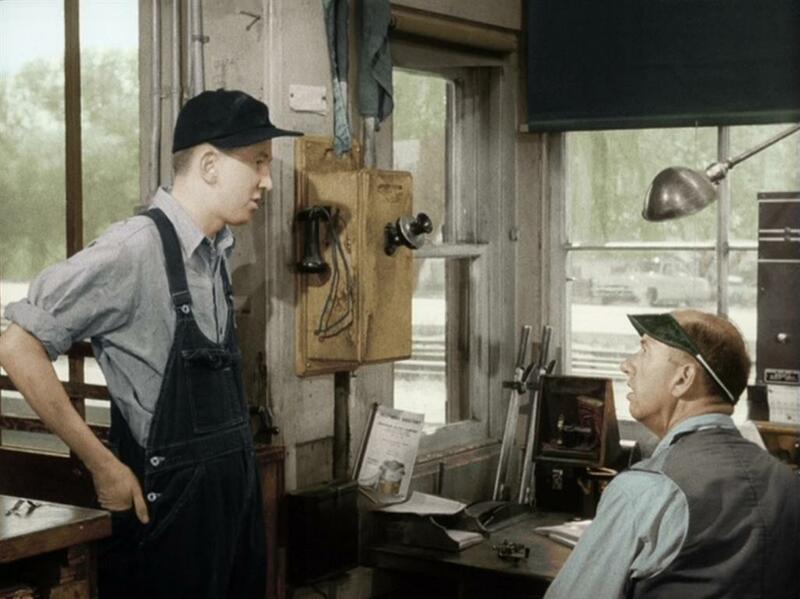 Overall view of the stationmaster’s equipment inside the depot; stationmaster tells his helper to run and get the town Sheriff (played by Sterling Hayden). 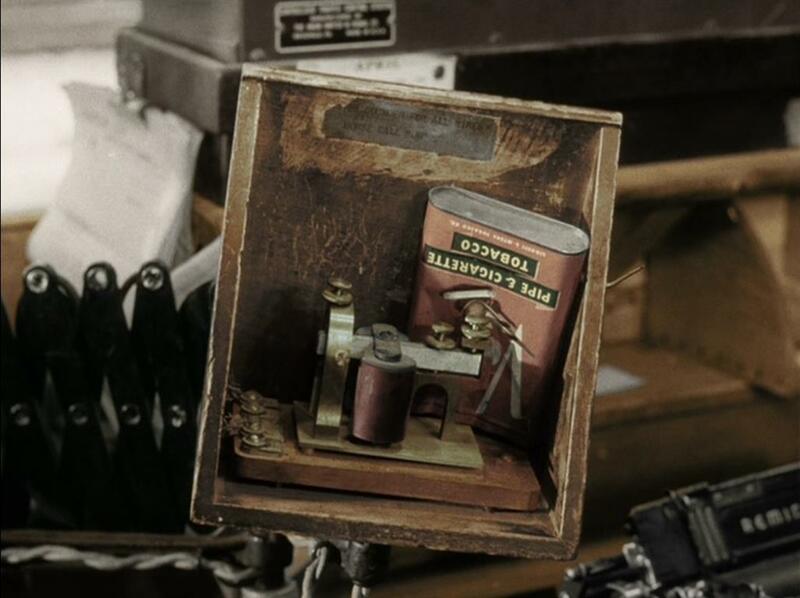 Another detailed shot of the Stationmaster typing at his Remington as his telegraph clatters away. Love that green visor! 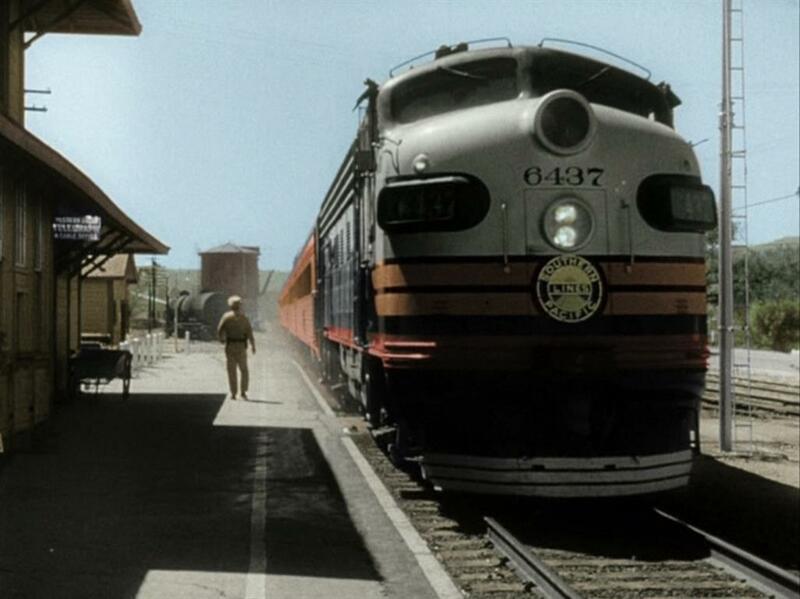 Helper runs across the tracks to get the Sheriff – wonderful SP-style station board, SUDDENLY on the depot; Beautiful “Black Widow” SP 6437 F7A unit leads some “Daylight Scheme” passenger cars into town. Backing up just a bit, MAJOR safety violation – Sheriff Hayden (who should know better), j-u-s-t makes it in front of the oncoming train. Kids, don’t try this at home! Another view of the Espee F7A unit and passenger cars. 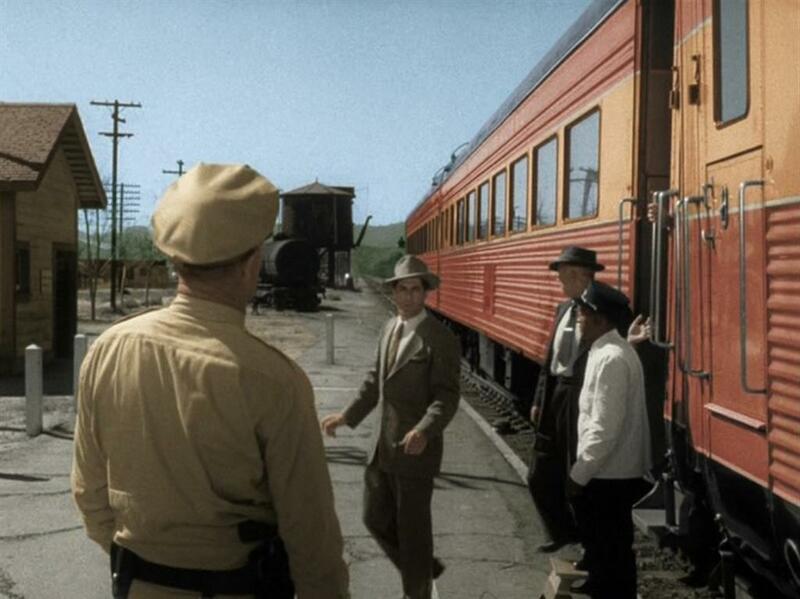 Sheriff Hayden greets the Feds as they step off the train. 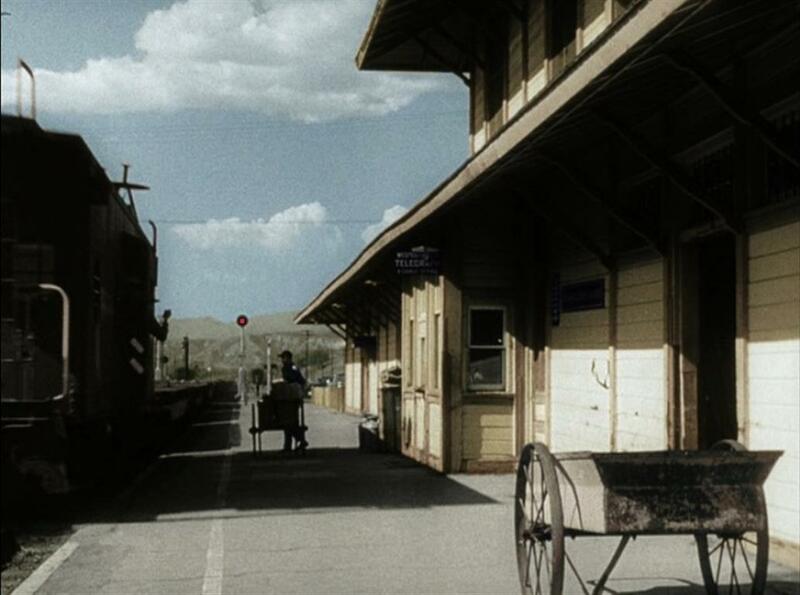 Notice the porter standing at attention by his step box and the water tower in the distance. 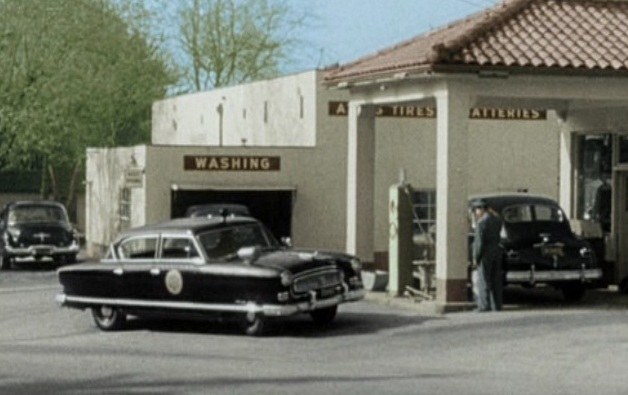 The Feds (Secret Service) check out the town whilst Sheriff Hayden rolls over to the local filling station and brusquely rents the limosine (for the President). Meanwhile, Frankie and his thugs have made their way into town and commandeered a house with a perfect shot at where the President will alight from the train. 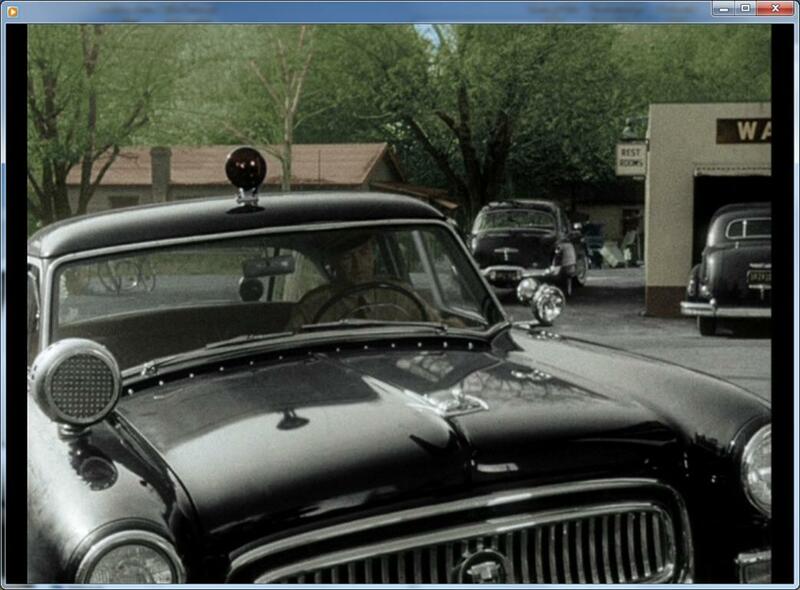 Sheriff Hayden rolls up in his 1953 Nash Ambassador police car (thanks for the car ID, Mark! ); Close up of the funky Nash police car — Oh, I want that fender-mounted siren! Old Blue Eyes as the menacing, slightly off-his-rocker, sniper. BOO! HISS! 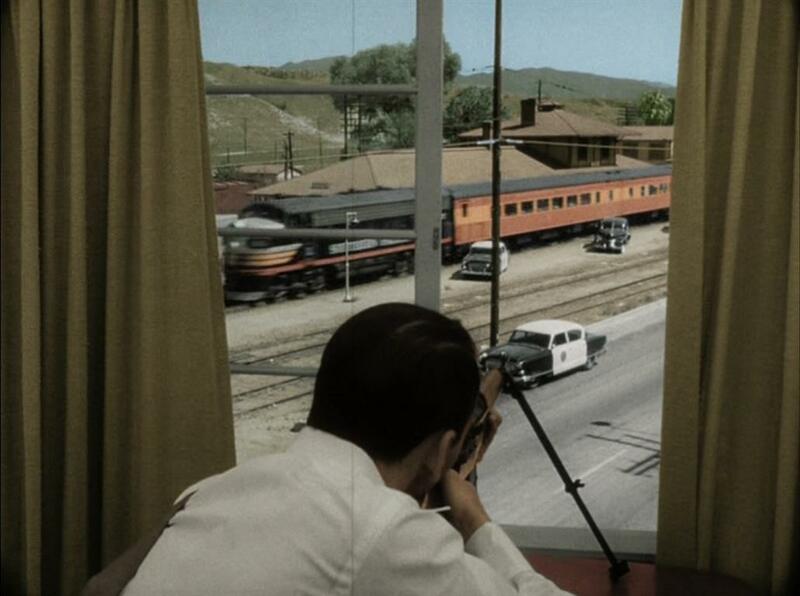 ; Frank watches an SP freight roll past the depot. Much plot left out here. 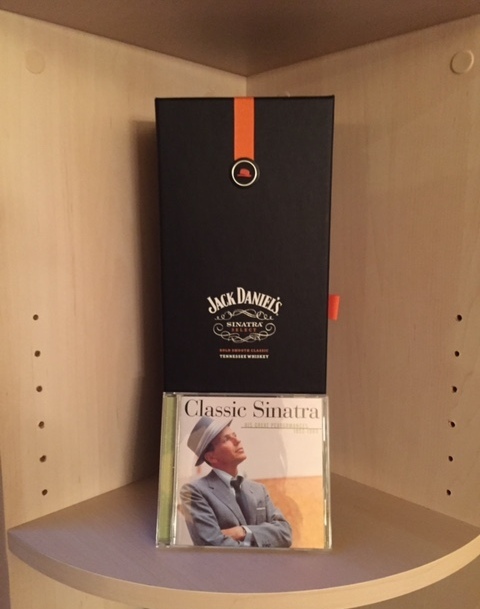 And I’m not going to tell you the entire ending, except Frankie gets his just desserts….but with a twist. 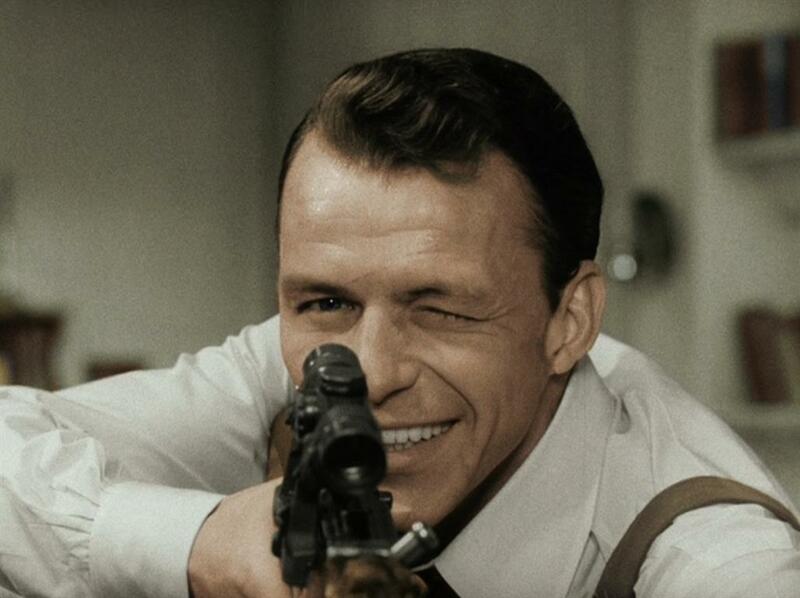 Sinatra joyfully takes aim…the President’s train rolls up and….and…. You’ll just have to buy, stream or borrow this movie to see how it turns out! 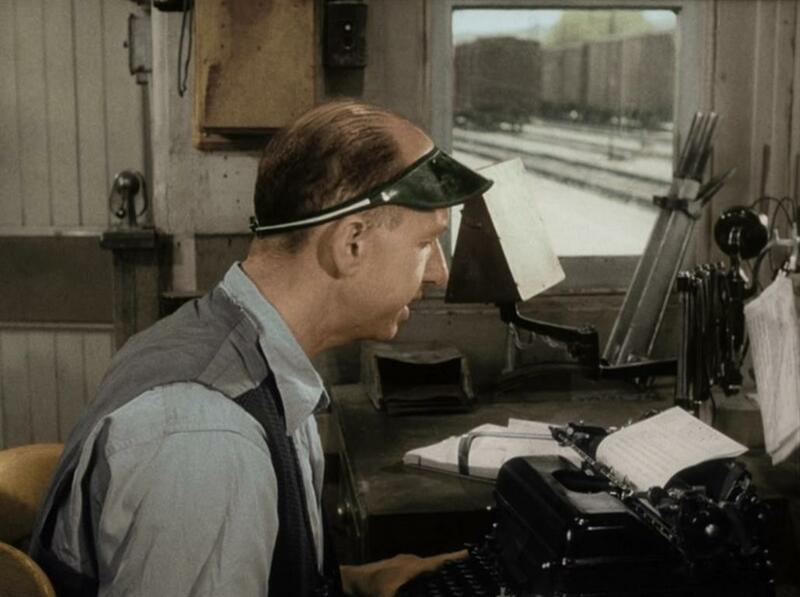 Great train scenes throughout and highly deserving to be in my Obscure Train Movies blog. Depot has been preserved and moved to a nearby park. 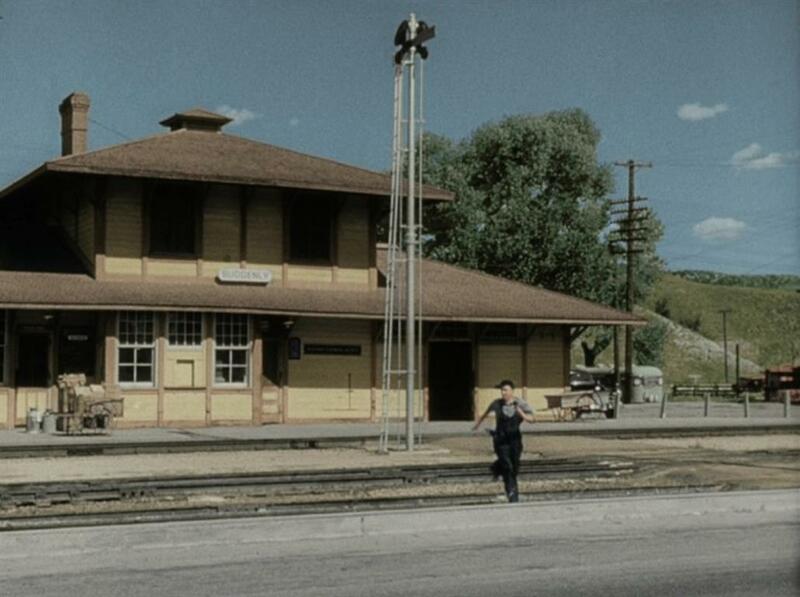 This entry was posted in Uncategorized and tagged 1953 Nash Ambassador, Black WIdow paint scheme, California depot, Espee, Frank Sinatra, Hal Roach Studios, Saugus, Southern Pacific Railroad, Sterling Hayden, Suddenly 1954, Suddenly movie, United Artists. Bookmark the permalink. Great post! 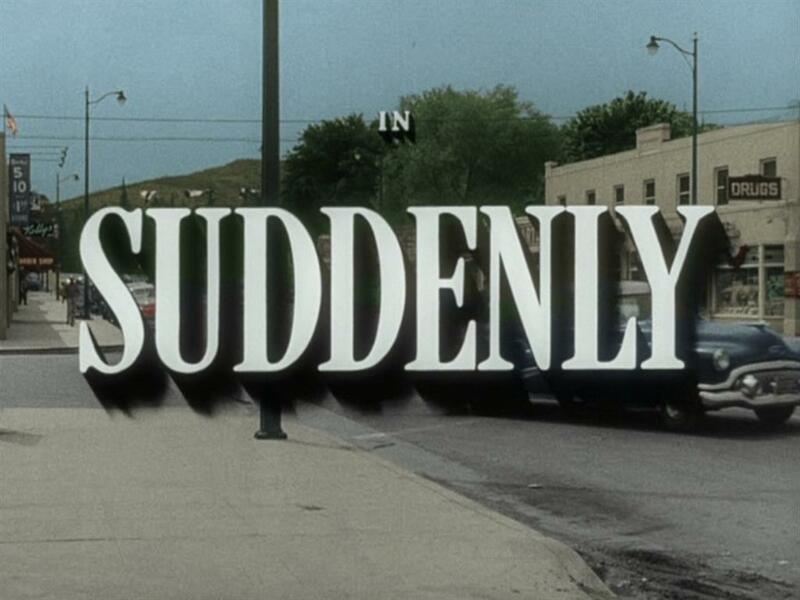 Train stuff aside, “Suddenly” is an excellent movie in its own right. Well worth seeing.